You don’t have to be in a car to be involved in a car accident. In fact, over 78,000 pedestrians are treated for injuries each year as a result of being hit by a car. Since a pedestrian has absolutely no protection from the impact, injuries are severe. Despite that, liability is difficult to prove, especially when the accident occurred outside of a crosswalk. The risk of injury or death is significantly higher in cases where the pedestrian involved is a high-risk individual such as a child, a senior citizen, or someone who is intoxicated. These accidents often lead to severe injuries to the pedestrian even if the driver of the vehicle remains completely unharmed. Liability in such cases is complex, especially if the pedestrian is partially at fault for the accident. In 2015, over 5,000 pedestrians are killed and another 70,000 were injured in automobile collisions. One of the most common causes of such accidents is unmarked crosswalks. These intersections make it difficult for pedestrians and drivers to recognize who has the right of way. Statistics show that three times more pedestrian injuries occur when a motor vehicle makes a left turn than when making a right turn. Many pedestrian accidents also occur because the pedestrian is distracted while walking. It is not uncommon to see pedestrians talking on the phone or texting while walking in intersections. Eight percent of pedestrian accidents occur when the pedestrian is using an electronic device. Pedestrian accidents are 70 percent more likely to occur at nighttime and 50 percent are more likely to occur on weekends. This can be attributed to poor visibility and substance abuse. Whenever a pedestrian accident occurs, it is usually assumed that the driver is at fault. However, the reality is that the pedestrian can be partially or completely at fault for the accident. The accident scene may need to be recreated and witness testimony introduced in order to determine if and to what extent each party contributed to the accident. If you were not responsible for the accident, an experienced car accident attorney will know exactly how to best defend any claims against the plaintiff for shared blame. A Missouri pedestrian settled their claim for $250,000 after being injured by a small pick-up truck. They were not in a crosswalk and visibility was poor at the time. Even though they shared part of the liability, facts showed that the driver bore the brunt of it. Injuries to a pedestrian vary greatly depending on the height and weight of the vehicle as well as the speed at which it was traveling. Most of the time the initial impact is to an adult’s lower legs causing the upper body to jerk forward onto the hood and windshield. If the car is traveling at a low speed then the pedestrian will remain on the hood and then drop to the ground when the car stops. Higher speeds mean more contact injuries as the body bounces on the hood of the car. At very high speeds the force of the impact can cause a person to fly over the vehicle causing even more injury as they hit the ground. Head trauma, bone fractures, and lacerations are all common injuries seen with pedestrian accidents. The group with the highest risk of being hit by a car is elementary aged children. Their small size and unpredictable behavior make them a target for pedestrian accidents. There is a higher duty of care expected in regards to children, and drivers should proceed with a greater degree of caution when in an area where children are known to be. If your child is injured by a motor vehicle retain a Missouri car accident attorney as quickly as possible. Injuries sustained by kids hit by a car may need extensive medical care and long term therapy. If a pedestrian acts outside of the way any “reasonable person” would in the same situation, then they might not be able to recover their injuries. A “reasonable person” is a legal term that states that someone has the duty to act as a “reasonable” person would in the same situation. For instance, if a pedestrian walks out in the middle of oncoming traffic and is hit, they would be failing to take reasonable care to ensure their own safety. Since the driver would not have been able to foresee the unreasonable actions of the pedestrian endangering themselves or able to prevent hitting them, the driver would not be held liable for their injuries. If you are a pedestrian hit by a motorist, and they are claiming that you didn’t take reasonable care and that they are not liable, you will have to hire a St. Louis auto accident attorney to bring the case to court. If you are injured, it is always a good idea to consult an attorney. It is not always the case that the driver is at fault. When pedestrians are involved in auto accidents, things can become complex very quickly. Can Drinking and Walking Make a Pedestrian Liable? Although the driver will often be found negligent in pedestrian incidents, there are cases when either the pedestrian can be held partially responsible for their own injuries, or they might be completely at fault in the accident. While it may not be illegal to drink and walk in Missouri, it is illegal to cross an intersection without a crosswalk or walk on streets not designated for pedestrians. This means that if an individual has been out on the town drinking and they fail to exercise the necessary caution to protect themselves, they could end up being held liable for any injuries that result. For example, if someone was drinking and a bar, left to walk home, and they were hit by a car because they walked out into traffic, they would likely be considered negligent. Depending on the circumstances, there may have been no way the driver could anticipate that the driver would walk out in front of their car. 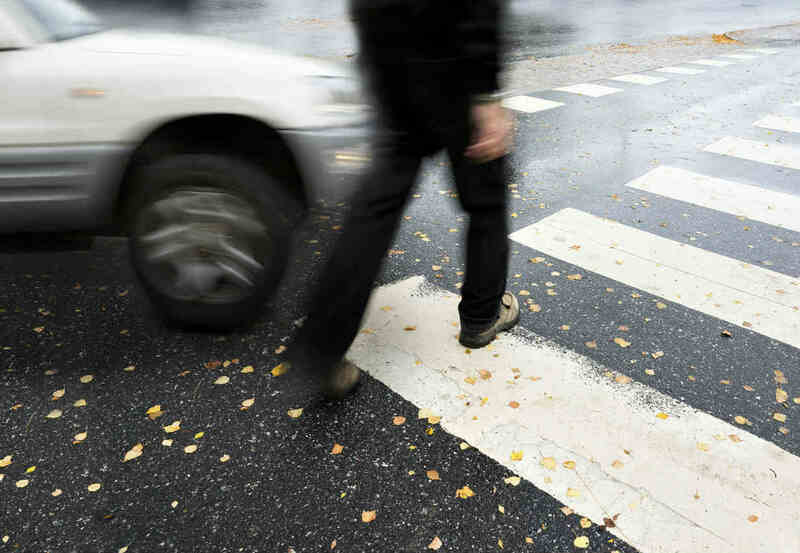 Injured pedestrians can recover compensation based on the principle of comparative negligence. The pedestrian can recover the amount of compensation reduced by the percentage of fault he or she contributed to the accident. Are Pedestrians Entitled to Collect Non Economic Damages? When a pedestrian is hit by a motorist, they will probably not suffer any property damages. However, they are entitled to collect for “damages” related to their injuries. Pedestrians may receive both economic and non-economic damages. Even though they do not have a car to repair, they likely will need compensation for the damage done to them physically and emotionally. Economic damages are things that are meant to compensate someone for all that they monetarily lost due to an accident. For a pedestrian, that would be things like medical bills, rehabilitation costs, and lost wages from work. If they are riding on a bike, then they are entitled to receive compensation for the cost of their bike repair or replacement, if they are not at fault. Pedestrians are also entitled to something called non-economic damages. They are damages that are meant to compensate someone for their experience or suffering. Things that fall under the umbrella of non-economic damages are more subjective than economic-damage. They are things like emotional distress or pain and suffering. Although not always easy to calculate, non-economic damages are a monetary award amount that is supposed to compensate someone for all that they have been through due to their injuries. How to Know What You Are Entitled to in Non-Economic Damages? When it comes to pedestrian-car accidents, pedestrians usually have extensive injuries while the driver of the car tends to suffer from far less severe damage to their body. The amount that they deserve depends on the severity of the accident and the extent of their injuries. A St. Louis car accident lawyer can calculate in quantifiable terms what your emotional and physical pain is worth. How Do You Know You Are Getting a Fair Settlement Offer? If you are in an accident and hit by a motorist, the best way to know whether a settlement offer is fair is to have an experienced St. Louis car accident attorney review your case. Be mindful not to sign for any settlement before you speak with an attorney. Once you sign a settlement, you absolve the insurance company from any further liability in your case. If you didn’t get all that you need or deserve, if you sign and accept an agreement, then you will be on your own to pay for any further costs related to your injury. No matter what the circumstance, you should get advice from a St. Louis car accident attorney if you are hit by a car. At The Hoffmann Law Firm, we have over 20 years of experience protecting the rights of St. Louis car accident victims. If you or a loved one have been injured, as a driver, passenger, or pedestrian, call our law firm at (314) 361-4242.